Capacity to produce 12,000 + daily. Put your entire company's catalog on your business card! 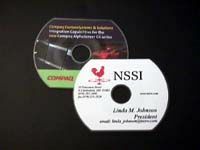 Give a complete multi-media presentation by leaving your business card behind! Unique, high tech way to promote your company's products and services.